Eiichiro Oda is a legend for all anime fans. He created one of the longest running, most successful, boundary breaking anime to ever be released: One Piece. A concern most anime fans have is in regards to staying true to the original material, so when Hollywood and Oda started discussing a live action adaptation, a wise Oda remained focused on the dedicated readers/viewers of the series thus far. With countless adaptation fails (slightly subjective, I know) under Hollywood’s belt, we’d all be right for being concerned about the integrity of the show remaining unscathed. As an anime writer myself, I am constantly bombarded by my own challenges of synergy across mediums, so I understand this angle intimately. A couple of the harder to accept failures for anime for me: Dragonball Evolution (2009), Attack on Titan (2015), Death Note (2017), Ghost in the Shell (2017). Poor marketing, changing source material, casting, direction, white-washing ethnic material… So many bad business decisions that have kept anime down until now. But anime is a medium that consistently grows despite these shortcomings. Maybe it’s nearly over. I’m just posing the question for all of us to think about: is Hollywood prepared to finally do anime justice? Or are we just in store for another disappointment. I’d like to stay optimistic here and say as we enter the 4th anime boom, I believe Hollywood (& Japan) will come to see it’s ability and importance to impact the global market. I’d really like for One Piece to survive the adaptation blackhole that is Hollywood. But if they don’t make it – you can believe Type Zero will. First of all, it’s always a huge win for anime when there’s a Hollywood live-action adaptation. Second, Scarlett Johannson is an incredible woman lead in action and sci-fi films. Third, Ghost in the Shell is one of the most revered anime of all time. Conclusion? Watch the trailer. While watching episode 23 of Ace of the Diamond, I was taught something about baseball that I’d never even learned during my four years of little league baseball: the balk rule. In ”School Academic Level”, Sawamura struggles to stay focused with runners on base and falls victim to the other team’s mind games. This forces him to commit a balk. This also began my Google search to learn more about this “balk” that I’d never heard of. I found that many other anime fans also went down the same path. To me, this is just why anime is awesome. The realism combined with fantasy is a combo that is unmatched by all other forms of storytelling. And this is just one little reason why. Oh, to be in the fair city of Detroit this weekend, to experience the silliness that is Youmacon 2013. The weather is cold. The cosplay is adventurous. The dancing is stupendous. And the lineup of panelist this year is worth every penny. -Michele Knotz – Voice of nearly every other character in Pokemon. I’m going to level with you folks. I am modestly (read: incredibly) biased toward this con, as it is in my hometown. Ain’t no party like a Detroit party, because a Detroit party will probably give you pneumonia if you don’t properly layer. As it is, though, I highly recommend it, if you’re someone who likes to shake your booty in the Renaissance Center. If it’s not too late, I recommend getting a room in the either the Renaissance Marriott or the Courtyard Detroit Downtown. Admittedly, super late, but the views of the city are worth every last minute dollar you spend. Plus, they serve as home base for the Con. Do it. Check out some pics from last year’s con, and tell me you aren’t looking forward to seeing what pops up from this years’s attendees. Youmacon – Where dreams do get awkwardly realized to heavy, heavy dubstep and house beats. Enjoy! It’s week three of the new fall season of anime, and I’ve gotten a chance to skim most of the new titles so far. I noticed something very interesting while I was watching… there were more than 5 new sports anime simulcasting this season. An unprecedented number compared to previous seasons, which one or two would be more commonly expected. Being a big fan of sports anime, such as Giant Killing and Kuroko’s Basketball, I highly anticipate almost any new anime with a sports theme. I believe the new quality of anime we’re enjoying in conjuction with the realism standard anime has always been best at, really allows for an exciting fusion of surrealistic action and dynamics. This is summarized quite well by Midorima from Kuroko’s Basketball. He reveals in Episode 11, that his shooting range is the entire court and it left the entire cast shell shocked. You will see some asses getting beat! If you’re looking for a history lesson on what makes a successful sports anime – this is probably it. The art style, eventhough revamped, is still a little outdated. However, if you love boxing, there’s a high chance you’ll love Hajime no Ippo. I am not much of a baseball enthusiast, but I love the Detroit Tigers. Executed correctly, I think a baseball anime would be really interesting for me. The first episode of Ace of Diamond was drawn well, but really just lacked action. I think it’s crucial to have a first episode that does more than set the tone (we saw this work ridiculously well for Attack on Titan last season). It should be aggressively attempting to hook you. That said, the baseball element is animated well, the voice acting is intriguing and I typically like the characters so far. I will give it another 3 episodes before I pass further judgement, but the first episode did not hook me. 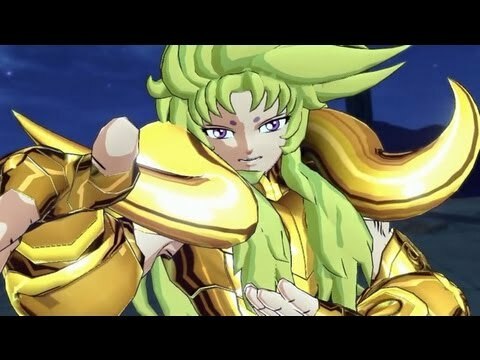 Saint Seiya: Brave Soldiers will feature a downloadable Gold Saint Aries Shion bonus character, for the Japanese release coming up this October. You can check this bloke out below. Brave Soldiers will feature more than 50 usable characters that you can customize to your heart’s content, and online play. The plot will follow the Sanctuary, Poseidon, and Hades arcs and is set to drop October 17 in Japan. Gamers can find it on the PSN Playstation 3 network on November 26 for the North American market. The October release will offer a Pegasus box, which will include the game, a Pegasus Seiya figure sporting the classic Pegasus cloth costume, and a code unlocking the corresponding costume in the game. The box is priced at ¥13,480 ($135). This release should be a good one. Tell all of your friends. Or, you could just be a little greedy guy and keep all the fun for yourself. We don’t judge here at Animeism. It’s just that kind of party.